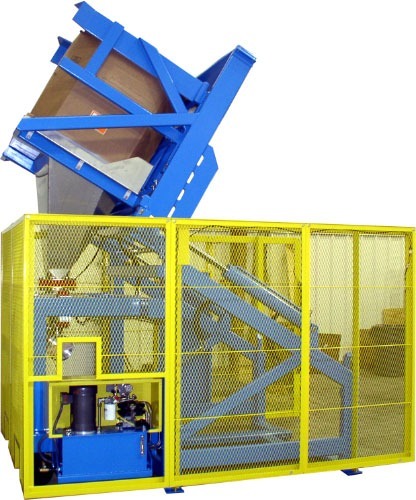 Accepts containers of plastic pellet loaded at floor level. Continuously welded heavy-duty tubular carbon steel frame. 304-2b stainless steel pour hood with a fully mounted air actuated 8” butterfly valve. Product discharges into a 4” diameter 304 stainless steel conveying eductor. MTS exclusive two-speed circuit provides reduced cycle times and smooth operation. Forklift portable base with casters on discharge side of unit. Flattened expanded metal safety caging on three sides of the unit. Safety light curtain protects load side of equipment. Electrical safety interlock feature prevents unit operation if light curtain beam is broken. Allen-Bradley electricals, Hoffman NEMA 4 control enclosure. 5 HP TEFC motor, 5 GPM Parker hydraulic system housed in a carbon steel enclosure for easy cleaning. Installation requires one power hookup to control panel and connection to an air supply.